Explanation: A new chapter in space flight began in 1950 with the launch of the first rocket from Cape Canaveral, Florida: the Bumper V-2. Featured here, the Bumper V-2 was an ambitious two-stage rocket program that topped a V-2 missile base with a WAC Corporal rocket. The upper stage was able to reach then-record altitudes of almost 400 kilometers, about the height of the modern International Space Station. Launched under the direction of the General Electric Company, the Bumper V-2 was used primarily for testing rocket systems and for research on the upper atmosphere. Bumper V-2 rockets carried small payloads that allowed them to measure attributes including air temperature and cosmic ray impacts. Seven years later, the Soviet Union launched Sputnik I and Sputnik II, the first satellites into Earth orbit. In response in 1958, 60 years ago today, the USA created NASA. Seriously. I'm not a forensic photo expert, but there is a lighter line that extends down and to the right from the pole that is next to the exhaust plume. At first I thought it was sunlight streaming through the scaffolding, but there is no corresponding shadows from the scaffolding, and regardless, the light line extends above the scaffolding toward the pole. Was there a guy-wire that the pre-NASA folk didn't like, and had covered-up? Also, is this the launch of Bumper 2, or Bumper 8? According to a nasa.gov site (https://www.nasa.gov/multimedia/imagega ... e_765.html) this is Bumper 2. On the other hand, wiki (https://en.wikipedia.org/wiki/RTV-G-4_Bumper) has a table listing Bumper 8 as the first launch from Cape Canaveral, and showing that with Bumper 2, the "First stage failed due to propellant flow interruption." This data appears to be correct, and taken from a fact sheet by the US Army. Happy Birthday, NASA. You're 60? But dahling, you look maaaaaaahvelous! Is today's APOD photoshopped? How would I know? More importantly, does it matter if the picture is photoshopped? In my opinion, no. The story is clear enough. In the beginning, NASA made a lot of beginner's mistakes. 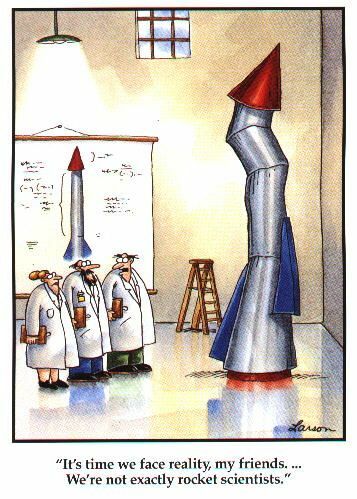 Then NASA learned how to do it, with a few very regrettable misses. "Photoshopping" a photo of historical value does matter, though in some cases not much. If this particular photo has been 'cleaned up', it's not a big deal. The big question in my mind is why is this photo labeled as two different launches? The WAC has no attitude control (Without Attitude Control) so presumably the V-2 would need to spin somewhat before releasing the 2nd Stage as there would be nothing to keep it pointing in the right direction. My first impression was... *damn* they are standing too close. The WAC was modified from its ground-launch version, and among other things, included spin rockets to stabilize it after separation. The NASA APOD text has been updated to incorporate the fact that 400 kilometers is, actually, on a par with the height of the (modern) International Space Station. We apologize for the oversight. Also, is this the launch of Bumper 2, or Bumper 8? According to a nasa.gov site (https://www.nasa.gov/multimedia/imagega ... e_765.html) this is Bumper 2. On the other hand, wiki (https://en.wikipedia.org/wiki/RTV-G-4_Bumper) has a table listing Bumper 8 as the first launch from Cape Canaveral, and showing that with Bumper 2, the "First stage failed due to propellant flow interruption." Indeed... it is the launch of Bumper 2 from White Sands Missile Base. Only Bumper 5 from WSMR achieved the famous 393 km (244 mi) altitude record. <<Prior to July 1946, Colonel H. N. Toftoy suggested the possibility of combining the V-2 rocket and WAC Corporal. This would provide a two-stage rocket capable of reaching heretofore unattainable altitudes and would greatly increase the possibilities of upper atmosphere research. On June 20, 1947, the Bumper Program was inaugurated. Eight of these missiles were assembled during the Bumper Program and the first six were launched at White Sands Proving Ground. The first Bumper-WAC was fired on May 13, 1948. This was the first large, two-stage rocket to be launched in the Western Hemisphere. This first combination rocket had a short duration, solid propellant motor propelling the second stage and the WAC attained only slightly more speed and altitude than the V-2. [Bumper 2] was fired on August 19, 1948 and, like Bumper 1, contained only a partial charge. The velocity of the V-2 was about ten percent below normal, but the steering was good. Up to 28 seconds the propulsion system was performing normally, but at 33 seconds the turbine started to overspeed. It reached a peak speed of 4,800 rpm a few tenths of a second later, then decreased in the manner typical of an overspeed trip. This action was attributed to the premature closure of the alcohol preliminary valve in the V-2, due to a failure in the controlling circuit. 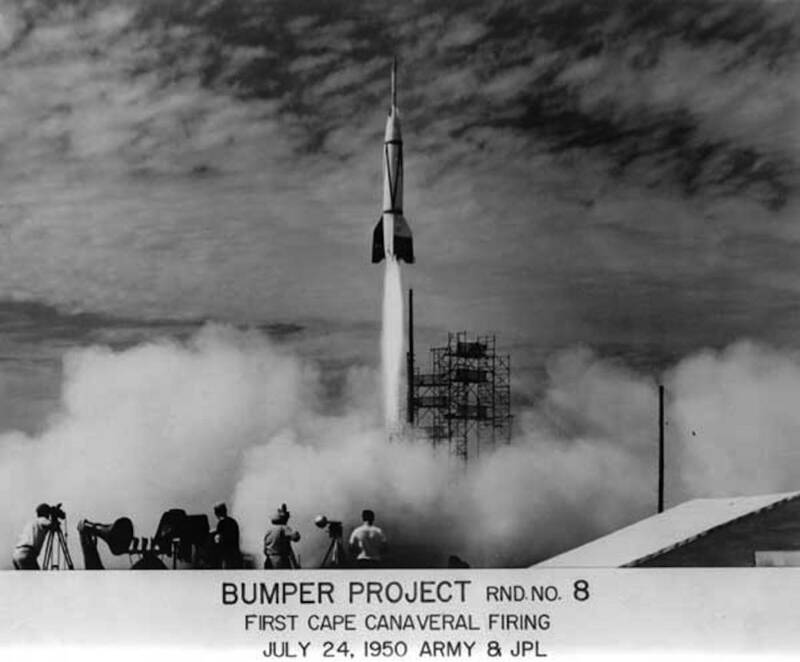 Bumper 5, fired on February 24, 1949, was the first Bumper to be fired with a fully tanked second stage which allowed 45 seconds burning time. This flight was successful in every phase. Thirty seconds after take-off the V-2 had attained a speed of 3,600 miles per hour and the V-2 and the WAC Corporal separated. The WAC, with its power added to that of the V-2, attained a speed of 5,150 miles per hour and an altitude of approximately 250 miles. This was the greatest velocity and the highest altitude ever reached by a man-made object. The nose cone was instrumented to measure temperatures at extreme altitudes. In addition, the WAC carried telemetry which transmitted to ground stations technical data pertaining to conditions encountered during flight. This was the first time radio equipment had ever operated at such extreme altitudes. Although the missile had been tracked by radar for most of its flight, more than a year passed before the smashed body section was located. Bumper missiles 7 and 8 were shipped from White Sands Proving Ground to Florida by standard Army tractor and flatbed for firing at the Joint Long-Range Proving Ground. Since the V-2 missiles previously shipped to Norfolk, Virginia, had been damaged in transit, modifications were made in the shipping cradle in that the rigid tail support was replaced by a partially inflated truck tire which provided a non-rigid support for the tail. The Army vehicle was driven with extreme care and the missiles arrived in excellent condition. To my understanding, the image depicts the (first) launch of a Bumper V-2 from the Joint Long-Range Proving Ground, which later became known as Cape Canaveral. As the 8th Bumper-Wac launch, it is also labelled BU-8. Here is a link: http://weebau.com/rock_us/bumper.php . Looking at the info in RJN's link, I wonder if those camera men knew there had been some sort of failure on 6 of the 7 previous launches or attempted launches. been some sort of failure on 6 of the 7 previous launches or attempted launches. This is clearly White Sands Missile Range where only the first 6 launches took place. This is probably only the second White Sands Missile Range V-2/WAC job launch. This telephoto gives no indication how close the photographers were actually standing. In what way is this "clearly White Sands"? That is the LC-3 tower at Canaveral, and we're almost certainly looking at Bumper 8, which was the seventh Bumper launch and the first at CC. I wasn't there, so I'm another person guessing. and that one is clearly labelled as Bumper # 8. 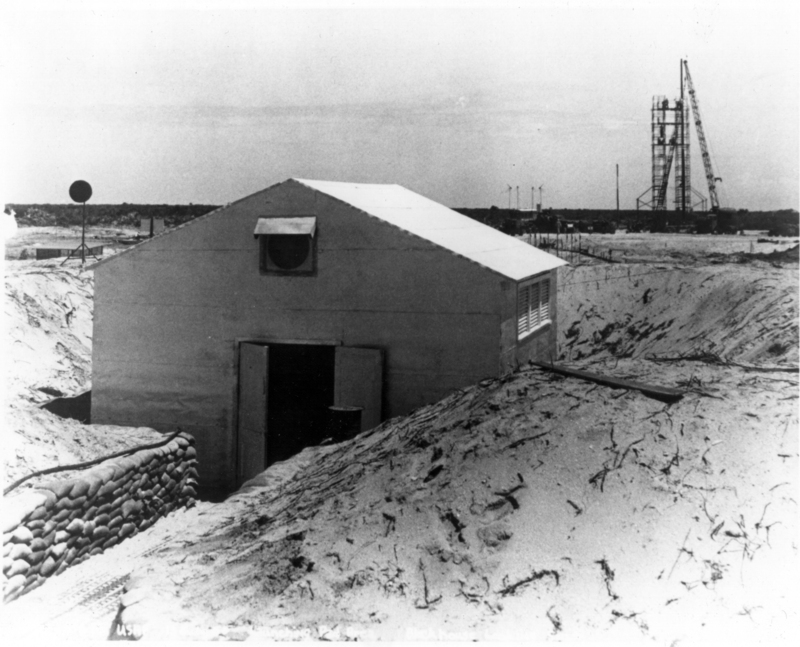 There is an image of the "blockhouse" at the Florida launch site that matches up with the APOD image. which makes me think that only the brave would stand anywhere near such an event. For me the evidence stacks up that the APOD image is at Cape Canaveral, the Florida "Reed Bed". If any doubt remains, I think I can read "B8" on the rocket's tail in the higher-res versions of the image ... unless photoshop, of course. The "Launched" link in APOD has more details and pics including info that the "blockhouse" is 500 feet from the launch pad. wiki (https://en.wikipedia.org/wiki/RTV-G-4_Bumper) has a table listing Bumper 8 as the first launch from Cape Canaveral, and showing that with Bumper 2, the "First stage failed due to propellant flow interruption." You had me at Cape Canaveral sand bunker #3, Mark. but the insinuation is horrible, hurtful & simply untrue. I pray his daughters are never treated this way. My question about the launch referenced in the featured photo seems to have stirred up quite the 'discussion'. I didn't mean for it to escalate into any kind of flame war. Anyway, thanks for all the info. It does look like the NASA caption for the photo is incorrect. They say, "A new chapter in space flight began on July 1950 with the launch of the first rocket from Cape Canaveral, Fla.: the Bumper 2. Shown above, the Bumper 2 was an ambitious two-stage rocket program that topped a V-2 missile base with a WAC Corporal rocket....Bumper 2 rockets carried small payloads that allowed them to measure attributes including air temperature and cosmic ray impacts..." Since they say "Bumper 2 rockets", maybe someone confused V2 with Bumper 2. And it's kind of ironic that both the White Sands site, and the Cape Canaveral site have white sand. The caption says "V-2", not "2". The caption is therefore correct. The APOD image is just a mirrored version of the last image on the page RJN referenced above.